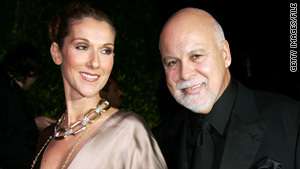 Singer Celine Dion and her husband, Rene Angelil, are now parents to twin boys. They also have a 9-year-old son. (CNN) -- Singer Celine Dion, 42, gave birth Saturday to premature twin boys. The yet-to-be named boys were delivered by cesarean section and are healthy, according to St. Mary's Medical Center in West Palm Beach, Florida. One infant weighs 5 pounds, 10 ounces, while the other is 5 pounds, 4 ounces, the hospital said. Obstetrician Ronald Ackerman, in announcing the births, called Dion and husband Rene Angelil two of "the most caring and kind individuals" that the hospital has seen. Dion checked into the hospital October 16 as a precaution "to prevent the early delivery of her babies," the medical center said. Her doctors had wanted Dion to remain there at least until the first week of November, when she would be 37 weeks along in her pregnancy, her representative said this week. Dion, 42, revealed in July that she was pregnant with twins after her sixth round of in vitro fertilization. The couple has a 9-year-old son, Rene-Charles.